Classic Orange ride quality in a modern package. How difficult it is to make a competitively priced bike in the UK. 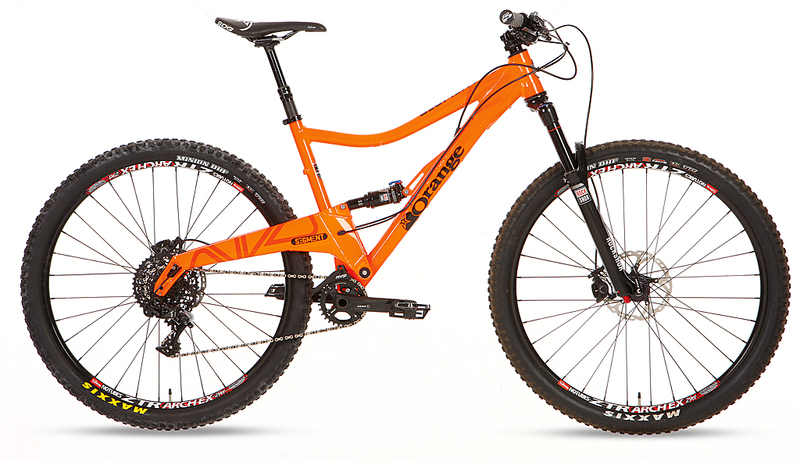 The Segment is a juicy new short-travel 29er from Orange. Packing 110mm of travel at the rear, it shares similar suspension numbers to Orange’s first foray into big wheels: the Gyro. This latest 29er from Halifax, however, sees changes to the geometry and a distinct shift in attitude. With a much slacker head angle, shorter head tube, improved standover clearance and increased range in the top tube, the Segment is squarely focused on trail riding — its genetic profile is now much closer to a Five than the bike that inspired it. There are four models in the Segment range with prices starting at £2,500 for the Segment S. The RS version tested here is the flagship RockShox-equipped bike with a multitude of upgrades. For the ultimate in personalisation, however, Orange offers a wide gamut of colours, and you can even build your own Segment piece by piece with a frame-only option for £1,500. All models share the same 6061-T6 aluminium frame, and, true to form, the Segment gets Orange’s signature pressed and seam-welded monocoque down tube and swingarm, with the latter featuring 142x12mm dropouts and RockShox’s latest Maxle design to improve stiffness. There’s still no chainstay protector to save the paintwork, or your ears, from chain slap, though. Nothing fancy is needed here, and Orange could do a lot worse than simply copying Whyte’s approach with some custom rubberised tape. Still, with the MRP 1x upper guide in place, you need never worry about dropping the chain. Don’t let the Segment’s simple single-pivot suspension fool you; it’s a very effective design. Unfortunately, the RockShox Monarch RL fitted uses a less sophisticated damping circuit to produce a very firm lock-out. As a result, the back-end on the Segment doesn’t fulfil its potential or, indeed, offer the same level of support as the fork. It’s still incredibly plush — perhaps too sensitive even — and when sat down climbing this translates into increased shock movement, especially on rolling terrain. To combat this we upped the rebound damping slightly, but given the Segment’s trail-riding credentials, we’d have much preferred to see a Monarch RT3 rear shock to better match the fork. Unfortunately it’s one of the few shocks unavailable among the custom-build options. Hope Pro II Evo hubs reinforce Orange’s made-in-Britain ethos, and, just like the Segment frame, they are built to last. The £60 upgrade option to Maxxis tyres is great value and easily gave the Segment the best rubber on test. Some of the other upgrades available are questionable, though. The addition of the “Performance Pack”, for instance, sees a perfectly good 800mm bar get replaced by a narrow 740mm Renthal FatBar Lite and matching Renthal grips. These rock-hard grips left us with pins and needles in our hands less than halfway round the less-than-taxing blue trail at the Forest of Dean. Given the high-end price tag it’s relatively easy to pick holes in the spec on the Segment. But the fact remains that the harder you push the Segment the more it gives back. It’s an increasingly rare quality in a trail bike but it’s one that will have you getting your foot out to drift corners and boosting off every blip on the trail. You’ll also be blown away by how well this 110mm-travel bike manages to carry speed on rough terrain. Even when it gets a little wild, the Segment gives you the distinct feeling that, if you hold it wide open, you’ll get through anything. That’s not to say the bike is without its faults, however. The back-end feels a little heavy, and it is — the rear wheel is 0.25kg heavier than that on the Whyte and it accounts for the entire weight difference between the two. Also, the rear shock really lacks the level of adjustment required to get the most from the suspension. Fast, fluorescent and fun to ride, the Segment is another great bike that proves 29ers aren’t just for mile-munchers. We loved how it railed corners and how the no-nonsense suspension design offered an engaging ride. The sizing is spot-on too, and there are more than enough spec options to keep everyone happy. Even the weight is competitive for an alloy bike. So what’s not to like? Basically… the price! It’s the only part of the Segment that’s hard to swallow and only you can decide if being made in England is worth the extra coin.